I am probably the last person you would expect to jump onto the Photo Freedom or Project Life bandwagon. And you would be correct. However, I promised my niece that I would work on her wedding book in this format, using her wedding colors, so here we are! I decided to use some Project Life-type items, along with Hampton Art stamps and various other things to create my niece an informal wedding album. Here is a double page spread that I did for her. As I noted, the black squares are for photos. I don't have any of the wedding photos yet, so I just added photo mats to indicate where photos should be placed. I stamped the "A Love Story" card in the top left section with the Jillibean Soup Irish Farmhouse Soup "love" stamp. I love the script on that one. 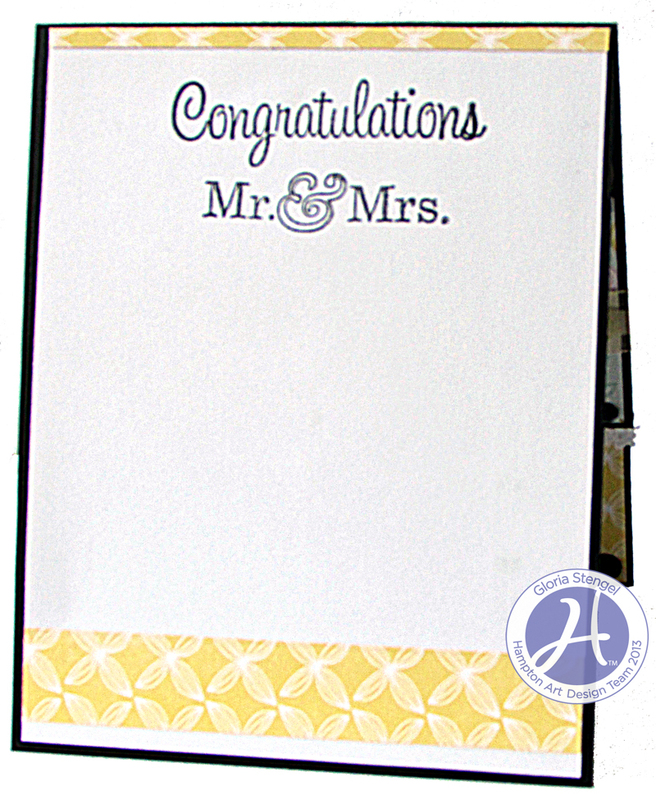 I also stamped the Authentique banner image onto white cardstock and fussy cut it and attached that to the Graphic 45 Secret Garden paper for the small center strip. For the second page, I stamped again on the Secret Garden paper using the children from the Authentique set and the date image from the Ki Flashback Storyteller set. 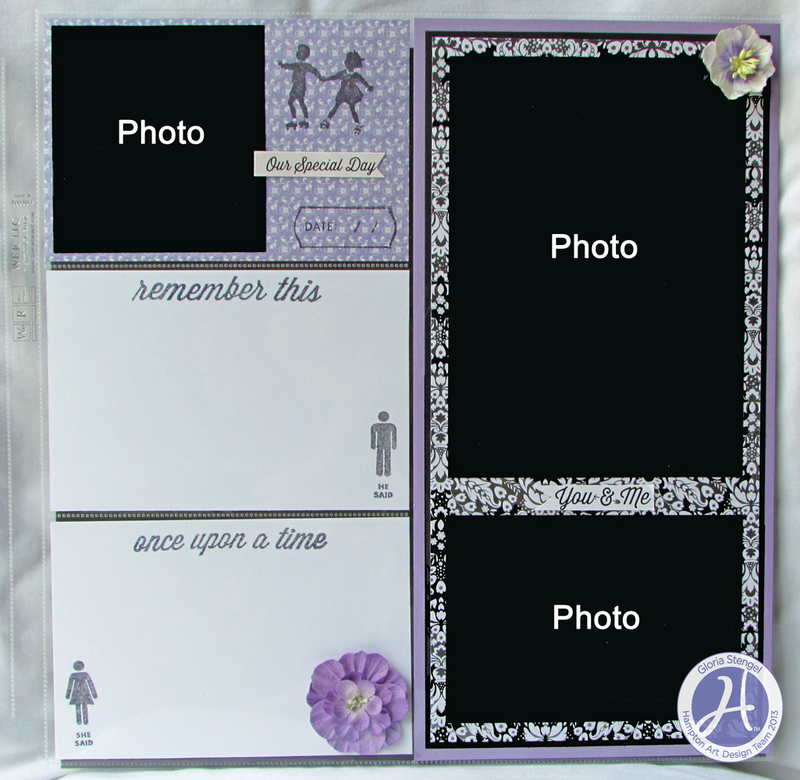 I created journaling cards for "he said/she said" using Ki Flashback Tick Tock and Storyteller stamps. Notice, that some of the stickers and flowers I used are place on the outside of the plastic sleeves. It just gives that bit of extra dimension I wanted. I think it is interesting to create pages in this Project Life format, but it is very hard! 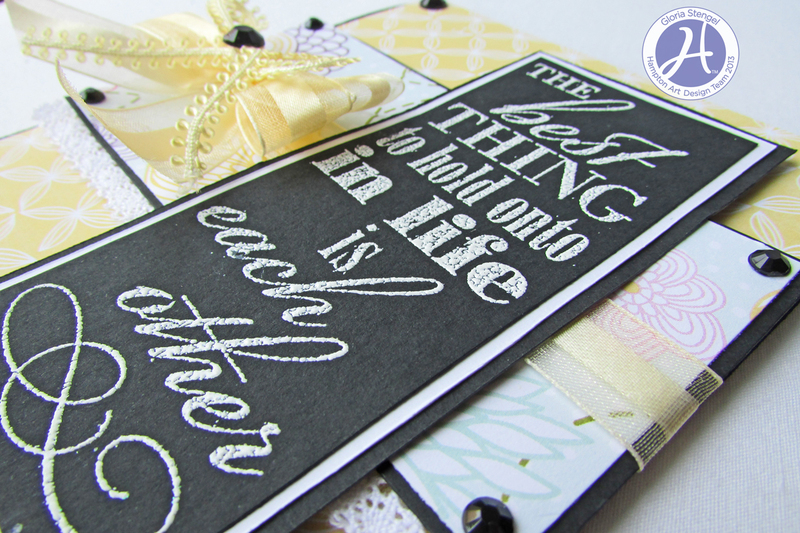 This is quite far outside my comfort zone of "one photo" layouts and heavy embellishments! However, I hope I have inspired you to give it a try! Chalkboard art is all the rage these days. I have found that most sentiment stamps with bold lettering can be turned into chalkboard art! It is hard to see the glitter in the photo, but it gives the card just a bit of sparkle, rather than the traditional flat chalkboard look. I allowed some stray embossing powder to stick to the paper, since most chalkboard art has that "messy" quality. I also stamped on the inside of the card. Lovely layout. 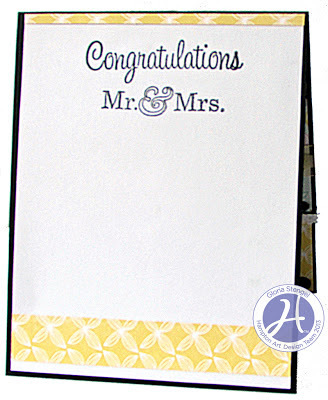 Love how you coordinated the cards with the wedding colors. 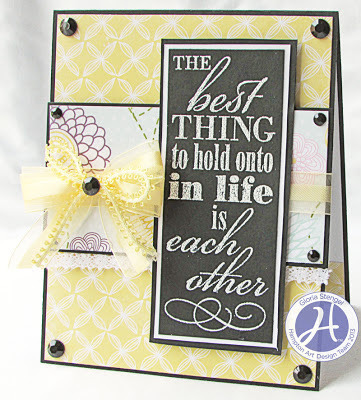 I especially like the Best Thing Is Each Other sentiment stamp. Very cool and it could be used for more than just weddings too. Enjoyed my visit.